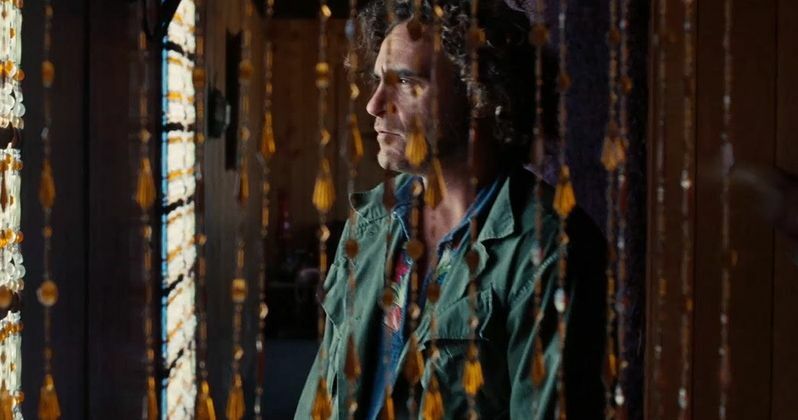 Following the first trailer from way back in September, Warner Bros. has released a new trailer for the upcoming adaptation Inherent Vice, which opens in limited release on December 12 before expanding nationwide on January 9. This trailer offers plenty of new footage, along with a more streamlined explanation of this complex adaptation, based on Thomas Pynchon's novel. The story centers on L.A.-based private investigator Doc Sportello (Joaquin Phoenix), who is roped in by his ex (Katherine Waterston) to find her new lover (Eric Roberts), after he was kidnapped by his wife and her boyfriend in a plot to throw him in the loony bin. It's the tail end of the psychedelic `60s and paranoia is running the day and Doc knows that "love" is another of those words going around at the moment, like "trip" or "groovy," that's being way too overused-except this one usually leads to trouble. With a cast of characters that includes surfers, hustlers, dopers and rockers, a murderous loan shark, LAPD Detectives, a tenor sax player working undercover, and a mysterious entity known as the Golden Fang, which may only be a tax dodge set up by some dentists... Part surf noir, part psychedelic romp-all Thomas Pynchon. For those who aren't in New York or Los Angeles, Warner Bros. has also announced that they are holding advance screenings of Inherent Vice in 14 cities across the country on Saturday, December 13. The cities hosting these screenings are Austin, TX, Boston, Chicago, Columbus, OH, Dallas, Denver, Kansas City, MO, Miami, Oakland, Philadelphia, Phoenix, Seattle, Toronto and Vancouver. If you live in or near one of these cities, CLICK HERE to RSVP for this special advance screening, and check out the new trailer below.